For 1967, Shelby added a bigger, more powerful Mustang to its current Mustang lineup, which consisted solely of the GT350. The new GT500 used the police interceptor engine – the 428 V8 (7.0-liters) rated at 355 horsepower. It was an immediate success and outsold the GT350 by almost 2 to 1. This car is special. We’ll start with something I didn’t know: Carroll Shelby was the West Coast distributor for Goodyear in the late 1960s. Goodyear asked him to help showcase their new economy tire. It was to be an extended high-speed demonstration and Shelby decided to build a super GT500 for this task. They pulled a GT500 off the line and equipped it with a racing 427 – essentially the same engine that the GT40 ran at Le Mans. It put out about 600 horsepower. Then it was equipped with the el cheapo-looking tires you see on it now and run for 500 miles at an impressive average of 142 mph (it topped out around 170!). The car was shipped to a Ford dealership in California afterward and the dealer wanted Shelby to build a run of these cars, but the price would have been exorbitant – being more expensive than the Cobra – and Shelby declined. The car passed through various owners until the current owner acquired it and performed a “light restoration” – putting back into test mode (and finding a nearly impossible-to-find set of original skinny Goodyears – the same model used in the tire test). This is the only GT500 Super Snake built and it will bring considerably more than the $5,000 that drove it off the Ford lot in 1967. Click here for more and here for more from Mecum in Indy. Update: Sold, Mecum Kissimmee 2018, $2,200,000. 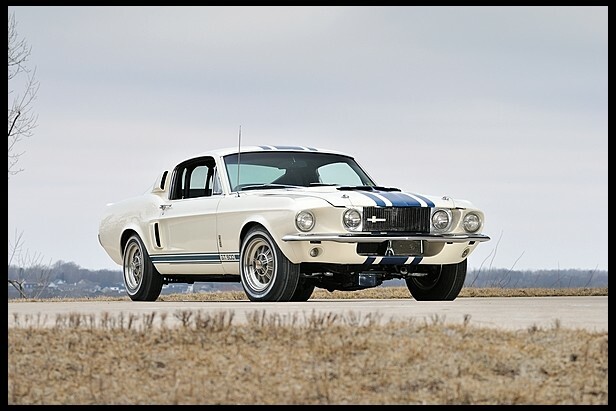 This entry was posted in Uncategorized and tagged 1967, auctions, cars, classic cars, ford, gt500, mecum, muscle cars, mustang, shelby, super snake by classiccarweekly. Bookmark the permalink. This car looks great and sounds great to. I never knew that there were only one of these built in the entire world. Anybody want to buy an arm or leg so I can buy it?